In today's New York Times there is a remarkable profile of an incredible man. Zhou Youguang should be a household name in China. He is 106 years old. As a Chinese language learner, I have immense respect for this man, who invented Pinyin. 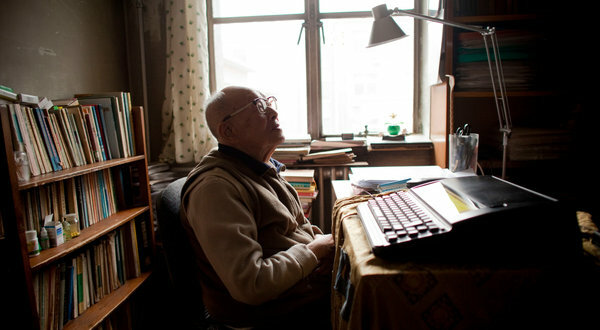 According to the Times, "Mr. Zhou is the inventor of Pinyin, the Romanized spelling system that linked China’s ancient written language to the modern age and helped China all but stamp out illiteracy." Remember, my question was, "What do you think about how we think different [sic] than one another?" My short answer is yes and no, but the 'no' is second intentionally. Yes, there are social and cultural differences that account for meaningful differences among the ways all sorts of differing groups think, let alone nationalistic ways. But, no, we do not think differently in more existential ways. There is a universal culture that trumps other essential frameworks in ever so slight ways. 'Emic' versus 'etic,' and I guess I come down on the 'etic' side, though if you ask me tomorrow I might have a different answer. Goodenough, Ward (1970), "Describing a Culture", Description and Comparison in Cultural Anthropology (Cambridge, UK: Cambridge University Press): pp. 104–119, ISBN 978-0-202-30861-6. Harris, Marvin (1976), "History and Significance of the Emic/Etic Distinction", Annual Review of Anthropology 5: 329–350. Harris, Marvin (1980), "Chapter Two: The Epistemology of Cultural Materialism", Cultural Materialism: The Struggle for a Science of Culture (New York, NY, USA: Random House): pp. 29–45, ISBN 978-0-7591-0134-0. Jahoda, G. (1977), "In Pursuit of the Emic-Etic Distinction: Can We Ever Capture It? ", Basic Problems in Cross-Cultural Psychology (Y.J. Poortinga, ed. ): pp. 55–63. I think the question which needs answering first is what you mean by "think." Are you speaking of values, beliefs, hierarchy of principles inherent (for the Chinese, and then conversely, for Americans)? Are you speaking of the actual steps in one's reasoning process, or of the rationale for those steps? And then of course, there's the acknowledgement that there are significant differences in the way those within a group will order their values/beliefs/hierarchy of principles. Some of that reflects subculture membership, and sometimes even with a control for those subculture memberships, we will find that there are differing values/priorities.... Although we are more likely to find agreement about what the "general you" should be prioritizing/valuing (whether the individuals would be making the same choice or not).